These notes were compiled from material gathered since 1980 by personal research & correspondence. I am especially grateful to the following "cousins" whose records, photographs, stories & oral traditions, along with my own, helped us all gain a better understanding of our East family heritage. This material concerns Joseph & Permelia (Cason) East, the parents of our ancestor Rev Martin Alonzo East of Sebastian County, Arkansas. Joseph East was born about 1807 in Oglethorpe County, Georgia. He was the son of James & Mary "Polly" (Edwards) East who left Henry County in southern Virginia during the late 1780's and settled on Little Indian Creek of Wilkes County, Georgia, later to become a part of Oglethorpe County. As an infant, Joseph traveled with his parents and grandparents to the Red River area of northern Robertson County, Tennessee. They resided there until 1817, when Joseph's father brought the family to Madison County, Illinois, settling in the Silver Creek area north of Highland. Joseph had older brothers named, Henry T., Hardman E.W., James, Josiah? & younger brothers William, Marshal A. & Matthew G. His sisters were Nancy & Ann Elizabeth. Joseph married Permelia Cason 5 March 1828, the daughter of Hillery & Mary (Smith) Cason, who left Screven County, GA during the 1820's and settled near the East family in Illinois. Joseph's parents died during the 1830's, probably buried somewhere in a family plot on their farm. This burial site has never been located. Joseph died at an early age of unknown causes during the 1840's. His widow Permelia and young children, Calvin, Martin Alonzo & Mary Melissa all left Illinois with Permelia's parents Hillery & Mary Cason & her brother Martin Cason, settling near Batesville, Independence County, Arkansas. A "family tradition" as related by Joseph's son Rev Martin A. East in his biography, suggests that his father Joseph died in the spring of 1839 when Martin was about 3 months old, with Martin moving to Independence Co Ark that same year with his mother & uncle Martin Cason. However Joseph & his family appeared on the 1840 census for Madison County, residing near his brothers William & James East, sister Nancy Howard, as well as his wife Permelia's father Hillery and her brother Martin Cason. Joseph later moved his family to an area in township 6 North Range 10 West, which is several miles northwest of his father's land & was enumerated on the 1845 state census in that township. It seems likely that Joseph died during the 1840's when Martin was about 5 or 6 years old & the family left for Independence Co Ark about that time. Tax & land records reveal that uncle Martin Cason made several trips to Independence County, Arkansas during the 1830's & 1840's. JOSEPH EAST indicted for Assault & Battery by the State of Illinois. 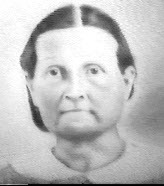 Permelia Cason was born 1812 in Screven County, Georgia, the daughter of Hillery & Mary (Smith) Cason who left Pitt County, North Carolina about 1794 with Hillery's parents, Hillery & Sarah Cason Sr, settling on the Savannah River in Screven County, GA. They were farmers and slave owners in both NC & GA. Her grandfather Cason served with the NC militia during the Revolutionary War. Permelia's father served in the War of 1812 while in Georgia. During the 1820's, when Permelia was still a child, she journeyed with her parents across the wilderness of northern GA, Tennessee and Kentucky to Madison County, Illinois. They settled in the Silver Creek area near the East family. Permelia married Joseph East 5 Mar 1828 and had 3 children, Calvin, Martin Alonzo & Mary Melissa. When Permelia's husband Joseph died during the 1840's, she took her 3 young children and joined her parents for another long journey to northeast Arkansas, settling near Batesville, Independence County. Several of her brothers & their families, including older brother Martin Cason & younger brothers Hillery III, & Simeon Cason also made the journey. In 1850, Permelia married Dr John Morris, who became the step-father of her children. Permelia's parents died during the late 1850's and Permelia herself died shortly before the beginning of the Civil War. Their burial places are unknown. About 2 years after her death, her oldest son Calvin East was killed in Murphreesboro, TN while serving with the Confederate Army under General Bragg. Permelia's son Martin Alonzo East, who had become an ordained Methodist minister and circuit rider had joined the Union Army & later settled in Sebastian County, Arkansas. His step-father Dr John Morris later joined him there. Permelia's daughter Mary Melissa East married John Gilbert Chipman & both died during the Civil War.